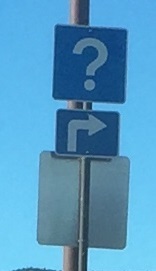 If you don’t know where to go, turn right! At least, I assume that is the meaning of this sign. Alternatively, the sign-maker might be a Doctor Who fan? Or, perhaps, this is how to get to a statue of the world’s largest question mark? I took this picture in Monument, Colorado. Sorry for the poor quality, but it was taken through a windshield from a distance.